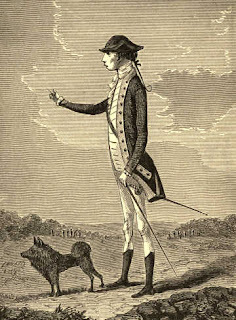 Gen. Charles Lee was captured in New Jersey on 13 Dec 1776. “Guiseppe” was Giuseppe Minghini, an Italian whom Lee had hired as a personal servant while he was traveling in Europe. The general was asking Minghini to join him in captivity—and to bring the dogs as well. One might think that Minghini brought the general’s his favorite pet, Mr. Spado, but that dog wasn’t available. TOMORROW: What happened to Spado?